This week a century ago an unknown Bosnian Serb shot a prince and triggered the worst conflict the world had yet seen. It involved millions and families still hold tell me down stories from loved ones that fought in this terrible war. This story, which I have told before, is ours. He looked ugly and mean, so much so that no one picked him. When Frank Christie arrived late at the army depot, that horse was the only one left in the pen. He had to take it. Frank was my great grandfather, and this story he told my mother. World War One was just a couple of weeks or months old and Frank had joined up. Just like in that movie War Horse, he was one of hundreds of thousands of soldiers around the world getting acquainted with the beast that was to take him into battle. This meeting probably took place in Pietermaritzburg or Durban, after my great grandfather had joined the newly formed signals corps. Prime Minister Louis Botha had decided that South African troops would invade German South West Africa. A citizen force had to be assembled and with it the horses to carry them. What that movie War Horse highlighted were the terrible conditions horses worked under and how millions of them died, during World War one. They were gassed, blown to smithereens by artillery or simply worked to death. But in the deserts of South West Africa, horses faced a different enemy to those on the Western Front. This foe was a small fly that carried African Horse sickness. Frank and that mean horse over the days and weeks slowly got to know each other, they became friends. It is likely man and horse landed at Walvis bay, where Botha massed his troops for the invasion. Horse sickness, soon took its toll, but Frank, my mother said, knew how to prevent the disease. How he knew this I don’t know, maybe it was something he had learnt while growing up in KwaZulu Natal. Every night he would rub his horse down with paraffin. This would keep the flies off during the day. As a member of the signals corps my great grandfather was responsible for sending back radio messages to headquarters. Radio was new technology back then and they were so big they were carried in wagons. I don’t know how much action my great grandfather saw, this conflict wasn’t as bloody as those taking place on the Western Front. By the time hostilities were over in July 1915, South Africa had lost just over a 100 men. The horses didn’t fare as well, in my great grandfather’s unit every animal that was picked that day in that pen in KwaZulu was dead, except one-Frank’s horse. I’d like to think that once it was all over his horse, made it back home to South Africa, to retire somewhere on a farm. It is unlikely the army returned their horses. Around Walvis Bay today there are wild horses that survive in the desert. 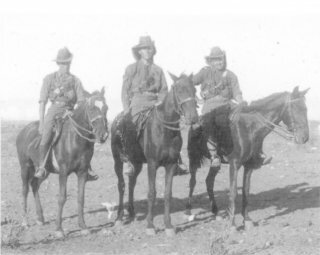 These are the horses the South African troops left behind. Perhaps some of those animals carry the blood line of Frank’s ugly mean horse. This entry was posted in artefacts from the attic, christie family, south african history and tagged German South West Africa, Louis Botha, south african history, War Horse, Western Front, World War I. Bookmark the permalink. Frank’s mother,my great grand mother, owned a large dairy in Scotsville ,Pietermaritzburg and also a mill which was situated on the ‘Duzi, called Mason’s Mill. He also had other relatives who where farmers in Natal .He told me that they all used a paraffin rag to wipe down their horses morning and evening in order to prevent them from getting African Horsesickness and that it worked.